Published in the South Kent Gazette, 17 December, 1980. Plans for the extension were approved on 20th December and subsequently a tender from the British Electric Equipment Company to construct a double track to River was accepted. Work began on 20th February the following year. There were complaints about the slow progress of the work and of the employment of some “foreign“ instead of local labour, for whose benefit the project was approved. Nevertheless work proceeded at such a rate that by the end of September the Board of Trade inspection was carried out, the Inspecting officer, Major Pringle, being completely satisfied with the running of tramcar No. 18 both on the level and the gradients. The official opening took place on 2nd October 1905, the first car, which was dressed overall for the occasion, being driven by Dover’s MP, the Right Hon. George Wyndham. All four of the new cars, purchased to run on the River service for £575 each, were on parade, decked with flags, for the opening. The steep incline down Crabble Road to Lewisham Road was the site of the most serious accident to occur during the life of the tramway system, On 19th August, 1917 the No. 20 River-bound tram got out of control, ran away down the 1 in 10½ gradient and overturned at the bottom. Eleven passengers were killed and many more injured. At the inquest the jury’s verdict was that the deaths were caused by the tramcar running away and that the cause of this was an error of judgment by and the Inexperience of the driver. At a Board of Trade inquiry it was also noted that the tramcar was seriously overloaded. Apart from those killed other passengers injured totalled 60. Another serious feature of the disaster was that the insurance cover of the Corporation was found to be insufficient and practically all the compensation payable became a charge on the rates. Total compensation assessed was £14,575 of which only £1,000 was recoverable from insurance. As a result the rates had to be increased by 7½p (1s 6d). The Board of Trade Inquiry was held a few days after the tragedy. The Inspector was told the tramcar which crashed had seating for 48 but the injured and dead totalled 70. The by-laws stated that oars were not to be overloaded, but the staff permitted extra standing passengers on the level. On the River route, however, instructions had been given to staff that no more than the seating capacity should be allowed. There were strict instructions, too, said the Tramway Manager, Mr E. Carden, that no standing should be permitted on the top deck. He said that tram cars were required to stop on the handbrake at the top of the hill. The slipper brake was then applied and progress of the tram down hill controlled by the handbrake. The hill had a gradient of 1 in 10½ and there was a speed limit for trams of 4 mph. The tramcar was in good condition and fitted with three braking systems. There were handbrakes, electric rheo-static brakes and a slipper track brake. The driver, who had only five weeks’ experience but was well thought of by the management, told the inspector he went over the brow of the hill without stopping and found the handbrake would not stop the car, so he tried to apply the slipper brake. By this time, however, the tram was gathering speed and the brake would not hold. The old and the new ... On the last day of December, 1936, the Dover trams ran for the last time. The following day the buses of the East Kent Road Car Company took over. “This picture shows typical traffic difficulties which will now be overcome, though others may arise.“ said the Dover Express on 1 January, 1937. 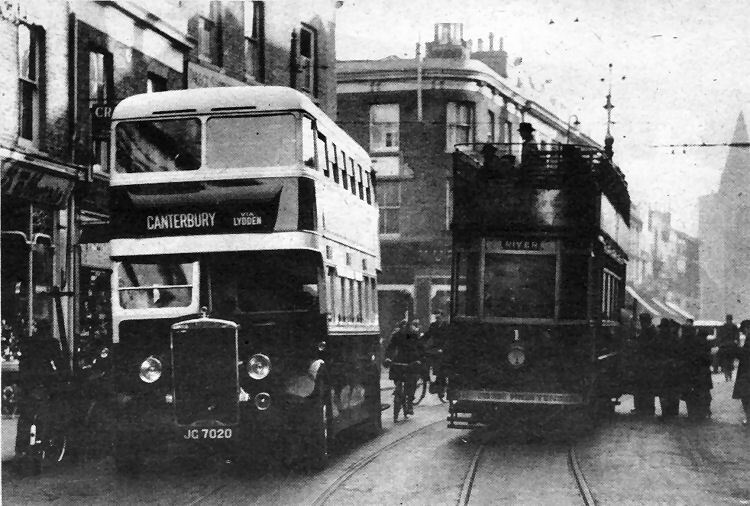 It will be seen that the Canterbury-bound bus had to cross over to the offside of the road to pass the River-bound tram, which was taking on passengers at the Worthington Street junction with Biggin Street. Pictured above, is the open-top tramcar which was involved in the second accident on the River route — an incident described by the photographer as an attempt by the trams to scrap themselves, a proposal to scrap the trams being under discussion at the time. 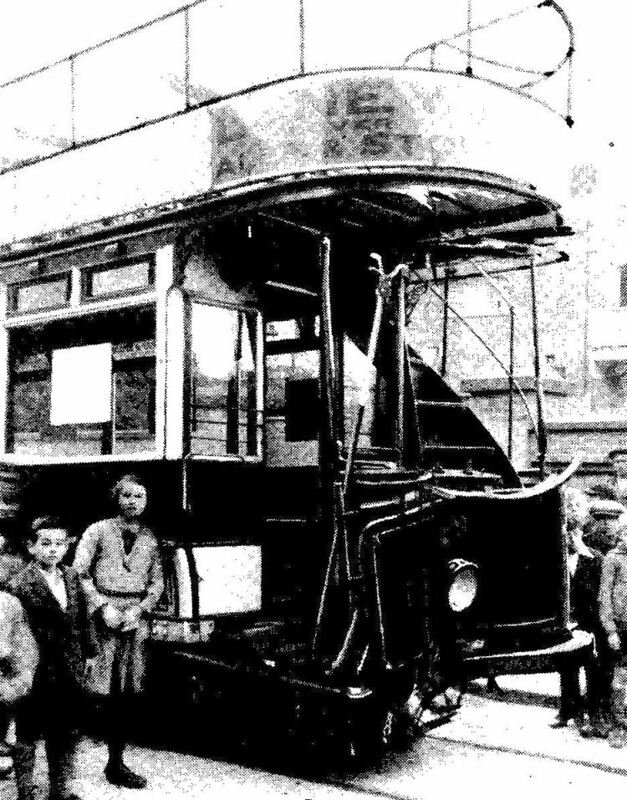 The tram, from River, with many schoolchildren aboard, got out of control on the slope by Crabble Athletic Ground, jumped the points at the bottom and collided head-on with another tram which had been coming down from Crabble Hill. This time only one frightened woman passenger, who had jumped off, was hurt. The above picture shows the Mayor, Alderman George Norman, guests and tramway staff at Maxton after Dover’s last official tram had made its service run from Worthington Street. 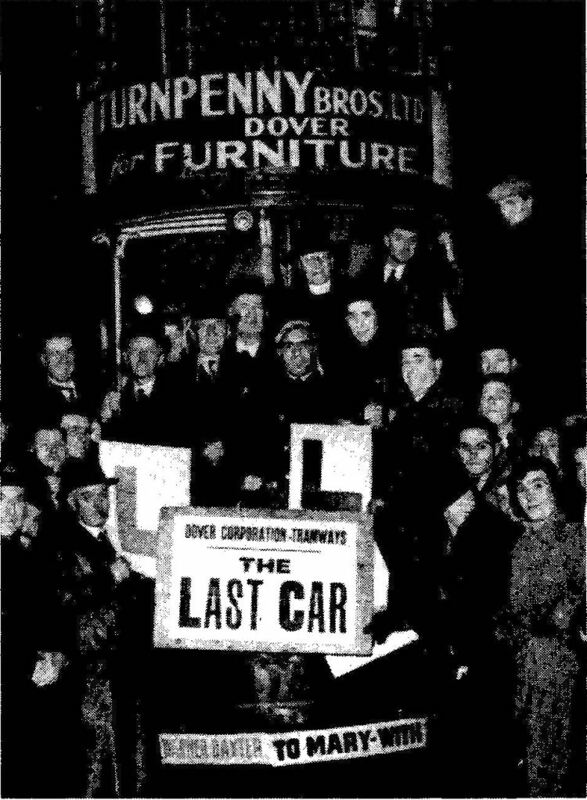 Jokers added the “L“ plates since it was the Mayor who took the controls for this run which marked the end of Dover’s tramway service, on New Year’s Eve, 1936.